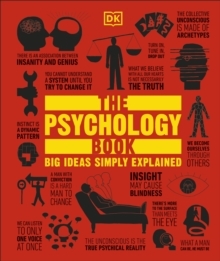 Explaining more than 100 of the most important big ideas and groundbreaking theories in the field of psychology in a clear and simple way, this is the perfect introduction to the history of psychology and understanding human behaviour. The Psychology Book provides an excellent introduction to the history of psychology from its roots in philosophy right up to modern studies of autism and psychiatry. The groundbreaking ideas of great thinkers in the world of psychology from Freud and Carl Jung to Noam Chomsky and Daniel Kahneman are outlined here. Covering all the schools of psychology including psychotherapy, cognitive psychology, and behaviourism, this handy reference is ideal for students or anyone interested in this popular subject. Hard-to-grasp concepts are explained in clear language with clever graphics that break down the ideas to make them accessible to everyone. And here is also a directory of psychologists and a useful glossary of psychological terms. If you're fascinated by the human mind then The Psychology Book will offer you lots of food for thought.